Unified SAN/NAS Disk Array: A disk array which can be partitioned into a block-based SAN array and a file-based NAS array. Dell EMC pulled out another complete victory being selected Market, Price, Performance, Reliability, Innovation, and Service & Support leader; unseating former five-time Market leader, NetApp. 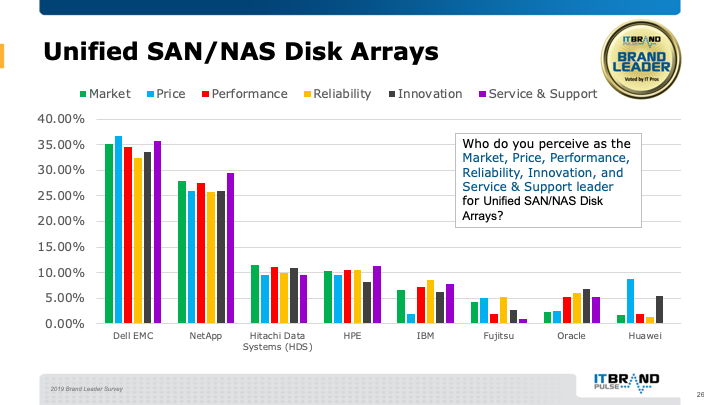 NetApp was voted second all-around in this product category and Hitachi Data Systems in third for Market.